I received a review copy of this book from the publisher in exchange for my honest thoughts. I love horror. It's my favorite genre because it consistently keeps me entertained. I like how in horror you can examine your very real fears often in settings that are unreal which makes it feel safer. I also like the fight and will to survive. And a good jump. Lately there's been an increase in turning slasher stories into longform stories. It sounds counter-intuitive and it is in many ways. Still, I enjoyed the TV shows Slasher and Scream more than I enjoy the typical slasher film. They allowed me to dig in deeper with the characters, care about them more, and thus be more invested in the stories and their outcome. Plus because the narrative needed to be sustained over time, they each had a great "who's the killer?" mystery. So when two fiction books came out last year with the same theme, I was interested. A lot interested. One of them was Final Girls. If you know horror, you know in slasher films there's a trope where basically a bunch of people get butchered but one girl survives. She's the final girl. Apparently, the term was coined in 1992 by Carol Clover in her book, Men, Women, and Chainsaws Gender in the Modern Horror Film. So last woman standing, final girl. This book centers on Quincy, a final girl who doesn't remember a lot about the night a lot of her friends got killed. She's one of three in the nation, and she has since moved on building a successful website/blog and maintaining a relationship with a significant other. 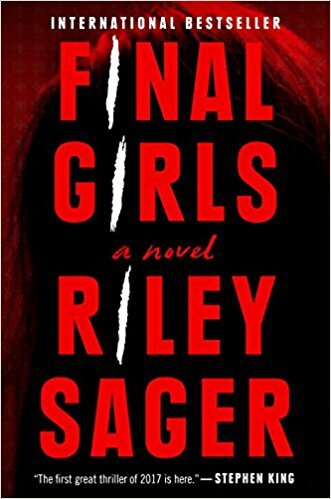 News comes that one of the final girls has killed herself which sets in motion a series of events that forces Quincy to take another look at her life and what happened in the woods all those year ago when her friends were killed. 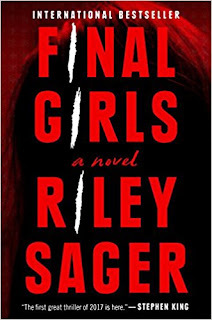 Final Girls is an engaging read. I enjoyed it. It's a good mystery with interesting developments. It's fairly quick paced and I was able to get engrossed in it easily. The ending is very satisfying with some delicious irony. It goes back and forth between the past and present but not every chapter or anything like that, mostly when it fits within the current timeline's narrative to do a flashback. I liked it, but I also wish it had been more, if that makes any sense. I'll be looking for more books in this genre and I will definitely read more from this author.